Buying cushions for sale will give you instant results. 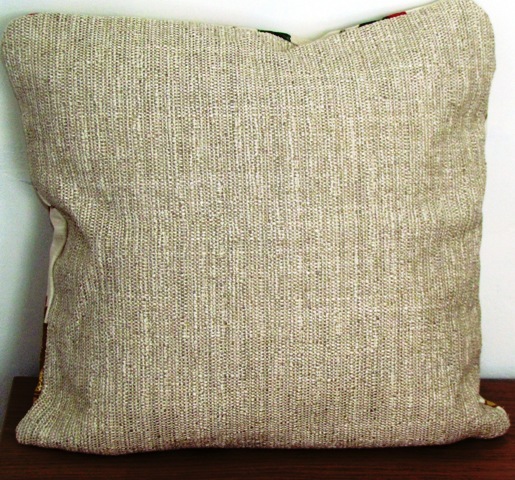 Buying cushions for sale will give everything you want in a cushion but without making it yourself. They can bring your room up to date, or show your favourite colour, hobby or interest. These can be changed to highlight the seasons or celebrations. During the course of making this website I have to sew items to get pictures to publish on my pages which results is ending up with some ready made. Please have a look at some I have already made, not forgetting some patchwork items as well. They are all made out of cotton or cotton mix fabric and have a zip fastening. Unless otherwise stated they are all approximately a finished size of 17 inches (43.5cms) square. Returns are accepted if they are returned in the same condition as received within 14 days with the buyer paying the return postage. All these items are made by myself and I do try and check the seams and zips for any defects before advertising. 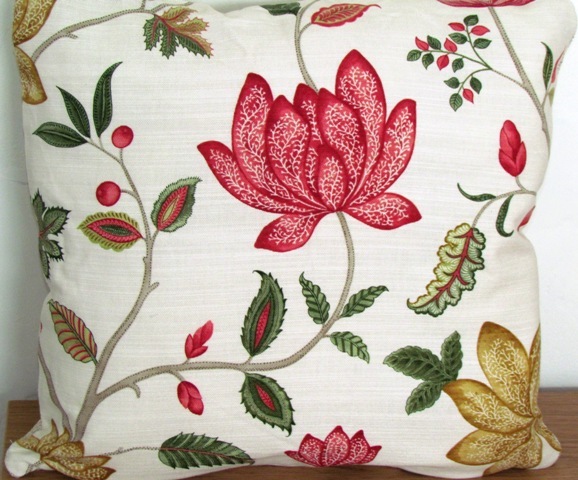 This fabric has a cream background with brightly coloured climbing plant with red flowers, green leaves with a hint of red in some and some gold coloured flowers as well. 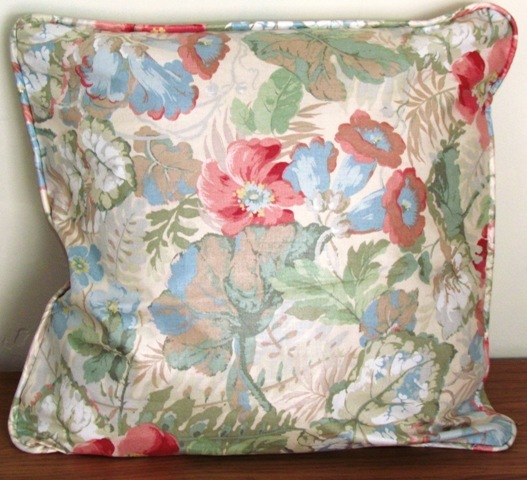 I have 4 of these cushions but the design on the front and the flower positioning will vary. The back is plain beige / cream textured fabric that compliments the front well. This material is medium weight. The cushion cover can be bought without the inner pad. This fabric is just beautiful with dusky blue, green and pink flowers and leaves on a cream background. There is self coloured piping around the edges and the zip is on the back panel about 9 cm (3.25 inches) from seam. The same fabric is on both sides. The fabric is a light to medium weight. I have 4 of these and the designs will vary in stock. 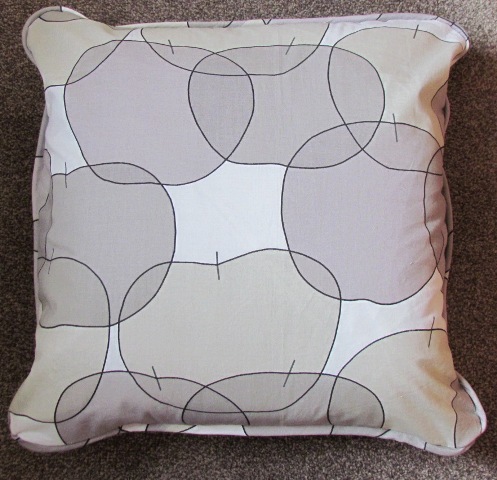 Price (per cushion) = £5.00 + £3.00 postage and packaging. Various Grey / Beige shades, Apple design front and back. This fabric is a light to medium weight and has outlines of Apples in various shades of beige and grey, the back ground is a lighter colour. Overall it shows a neutral colour. This has a piped edge and a zip fastener.